New Logic is an OSF bull out ofan ET brother to the 2002 Reserve National Champion bull WCC Dew Design and a genetically powerful King John cow. He stamps his progeny with big, square hips, good feet and legs and an incredible rib shape that some deeper sided females lack. 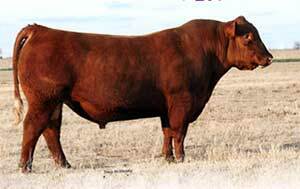 It is hard to find Red Angus with these features and combine it with phenomenal production traits. His calves will perform with any other sire as he ranks in the top 1% for weaning and the top 2$ for yearling.